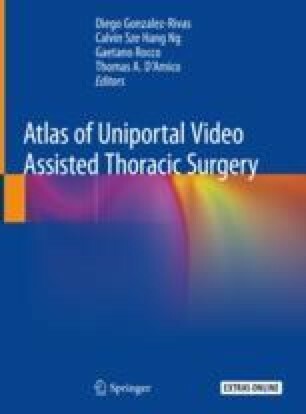 The Uniportal Transthoracic approach for posterior mediastinal tumours is a succinctly described technique, it is feasible and safe, and offers a good view and exposure of the operating field in the posterior mediastinum. A 3–4 cm incision is made in the fourth, fifth or sixth intercostal space depending on the location of the lesion at the level of the anterior axillary line. A 5 mm or 10 mm, 30° high definition video camera is always used. The Uniportal VATS approach can be used for diagnostic procedures or complete excision of the posterior mediastinal tumours. In this chapter we explain how to perform the dissection and resection of the posterior mediastinal tumours by uniportal approach. The online version of this chapter ( https://doi.org/10.1007/978-981-13-2604-2_10) contains supplementary material, which is available to authorized users.